Cherney’s Technical Resource Team are experts in the design and performance of custom projects, delivering the scientific data needed to achieve your study objectives. Evaluation of Potentially Hazardous Food: A challenge study was performed on multiple product types to demonstrate food safety and quality under cycling temperatures in a retail environment. Proximate analysis evaluated baseline properties. Product was inoculated with pathogens, held under cycling temperatures and microbial testing performed at five time points. The study provided supporting data for a larger project objective to modify standard food storage conditions. Shelf Life Verification for Product Change: A shelf life study was conducted to demonstrate product quality following a formulation change. Product was stored under controlled conditions, sampled at five time points and tested for microbiological and analytical characteristics. The study demonstrated the new formulation did not affect product quality, and the change was implemented by the customer. Refrigerated Meal Challenge Study: A food safety assessment was completed on refrigerated, prepared meals distributed for retail sale that were challenged with pathogenic organisms. The meals were stored under controlled conditions to simulate retail storage and handling and evaluated for shelf life indicators and pathogen levels at multiple time points. The study supported research and development modifications for product formulations. 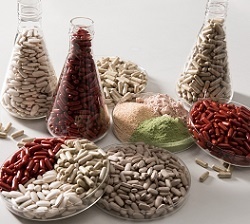 Method Verification for Product Matrix: A method suitability study was performed to demonstrate the ability of USP test methods to detect microorganisms in the presence of the product. Sample preparation methods were determined for insoluble powder matrices and acceptable microorganism recovery was achieved. The study met USP requirements for suitability and set forth routine test methods. Looking for help? Contact Cherney's team to find out more information.